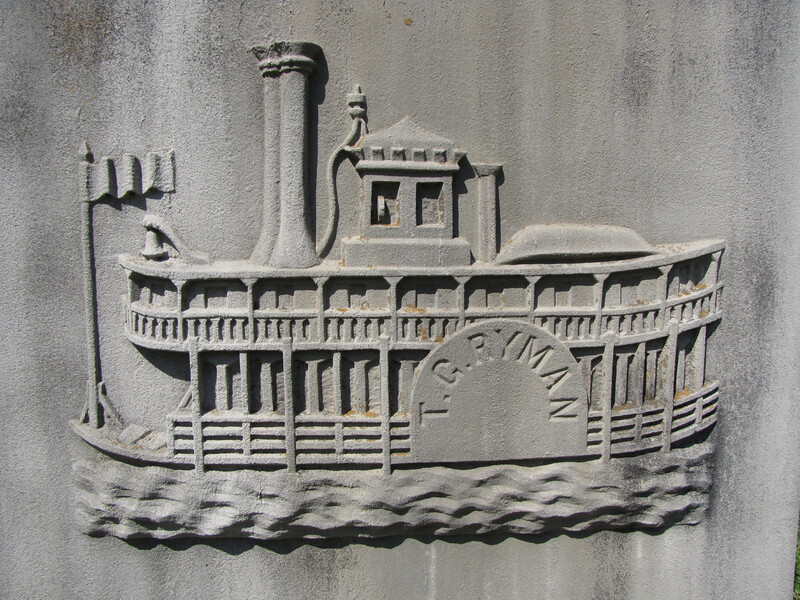 A large gray monument displaying a steamboat in the Mount Olivet Cemetery at Nashville marks the grave of Thomas Green Ryman, (October 12, 1841-December 23, 1904) one of the most successful steamboat captains in Tennessee history. Ryman built a fleet of 35 steamboats to carry goods and people on the Cumberland and Tennessee Rivers. Though he had a very successful career as a steamboat operator, few, other than historians, remember his name for his fame on the river but instead for the tabernacle he built. In 1885, Ryman went to an old fashioned tent revival to hear evangelist and preacher Sam P. Jones of Cartersville, Georgia, deliver one of his spellbinding sermons to a crowd of 7,000. Ryman was a skeptic and had the intention of going to heckle the minister. But something else happened that night—the salty steamboat captain “got religion”. Captain Ryman was so moved by what he heard that night that he converted and as a demonstration of his faith agreed to build a large auditorium—the Union Gospel Tabernacle at Nashville. Construction began in 1889 and was finished in 1891. 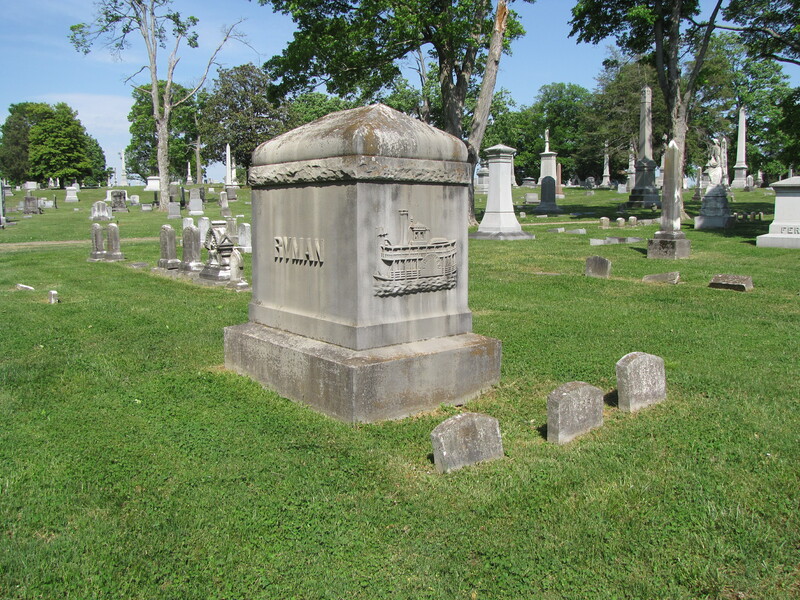 Thirteen years later, on December 23, 1904, Captain Thomas Green Ryman died. The headline in the Nashville Banner read, “CAPT. RYMAN’S LAST VOYAGE, Crossed the Dark River Yesterday Afternoon, FUNERAL IN TABERNACLE”. In an obvious nod to his days as a steamboat pilot, the newspaper described his death as “crossing the dark river.” The very same preacher Sam P. Jones who moved Ryman to convert delivered his stirring eulogy and suggested that the tabernacle be renamed the Ryman Auditorium to honor his friend. The story didn’t end there. In 1943, the Grand Old Opry, a very popular radio program that featured famous and those who wanted-to-be-famous country and western singers and musicians, began to broadcast from the Ryman. For the next 31 years the Ryman Auditorium featured country and gospel singing legends such as Patsy Cline, Jim Reeves, Johnny Cash and June Carter, Loretta Lynn, and Porter Wagoner. Even though, the Ryman Auditorium is no longer the home of the Grand Old Opry, it is still known as the Mother Church of Country Music built by a saved steamboat captain over a century ago! What an interesting gravestone! I find it fascinating how some gravestones are very plain and others so clearly share some significant part of the deceased’s life. Great post!